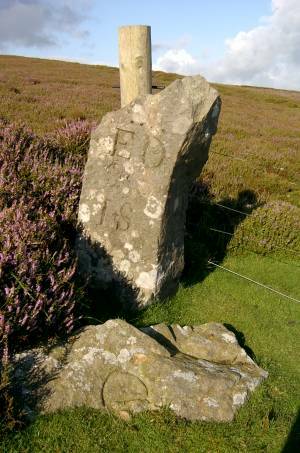 Record Description GRI-8 is boundary stone number eight of the first 21 around Grinton Parish starting from Stolerston Stile and reaching as far as Gibbon Hill. It is on the boundary line between the parishes of Grinton and Ellerton Abbey, 150m south-west of the Grinton-Leyburn road, on the east side of Sharrow Hill. 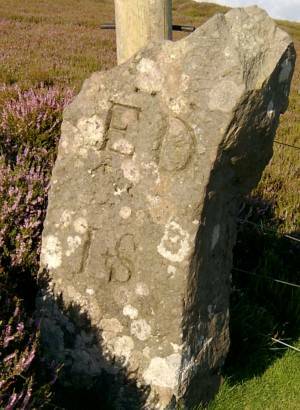 It is inscribed on the east face with a row of four horizontal dots, ED, and I+S. At the foot of the stone is a natural rock inscribed D. ED is thought to signify the Erle-Drax family of Ellerton Abbey, which would date the stone to sometime between 1755 and 1887 (see additional notes below). 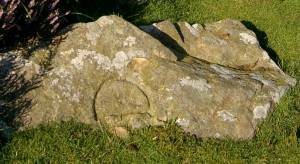 The D on the rock would be for Drax and would therefore date to before 1755. The other symbols are unexplained. However, of the four stones on this boundary line bearing the letters I and S (see also records 558, 559, 560) this is the one on which a small + symbol can be see most clearly between the two letters. It suggests that I and S represent two different family surnames.